Manage SSL certificates, create certificate requests, and import certificates signed by a certificate authority. The BeyondTrust Cloud Appliance comes with a pre-installed certificate signed by a certificate authority (CA). This certificate validates the *.bomgarcloud.com domain. If you wish to change the fully qualified domain name (FQDN) of your appliance, you must install a CA-signed certificate which validates your new FQDN. To do this, you must create a certificate signing request (CSR) from the BeyondTrust Cloud Appliance as described below, or use Let's Encrypt to obtain a certificate. If you choose a custom hostname for your appliance, you may use the built-in Let's Encrypt functionality for your SSL certificate. For more information on certificates, see SSL Certificates and BeyondTrust. Locate the Security :: Other Certificates section and click Create. In Certificate Friendly Name, enter a name you will use to identify this certificate. 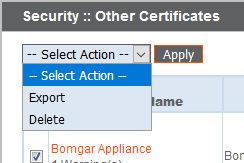 From the Key dropdown, choose the Existing Key of your *.bomgarcloud.com certificate. Enter the remaining information pertaining to your organization. In the Name (Common Name) field, enter a descriptive title for your BeyondTrust site. In the Subject Alternative Names section, enter your BeyondTrust site hostname and click Add. Add a SAN for each DNS name or IP address to be protected by this SSL certificate. DNS addresses can be entered as fully qualified domain names, such as access.example.com, or as wildcard domain names, such as *.example.com. A wildcard domain name covers multiple subdomains, such as access.example.com, and so forth. To use a CA-signed certificate, contact a certificate authority of your choice and purchase a new certificate from them using the CSR you created in BeyondTrust. Once the purchase is complete, the CA will send you one or more new certificate files, each of which you must install on the Secure Remote Access Appliance. To upload your new certificate files, click Import. Browse to the first file and upload it. Repeat this for each certificate sent by your CA. Often, a CA will not sent their root certificate, which must be installed on your Secure Remote Access Appliance. If the root is missing, a warning appears beneath your new certificate: "The certificate chain appears to be missing one or more certificate authorities and does not appear to terminate in a self-signed certificate". To download the root certificate for your appliance certificate, check the information sent from your CA for a link to the appropriate root. If there is none, contact the CA to obtain it. If this is impractical, search their website for their root certificate store. This contains all the root certificates of the CA, and all major CAs publish their root store online. Usually, the easiest way to find the correct root for your certificate is to open the certificate file on your local machine and inspect its "Certification Path" or "Certificate Hierarchy". The root of this hierarchy or path is typically shown at the top of the tree. 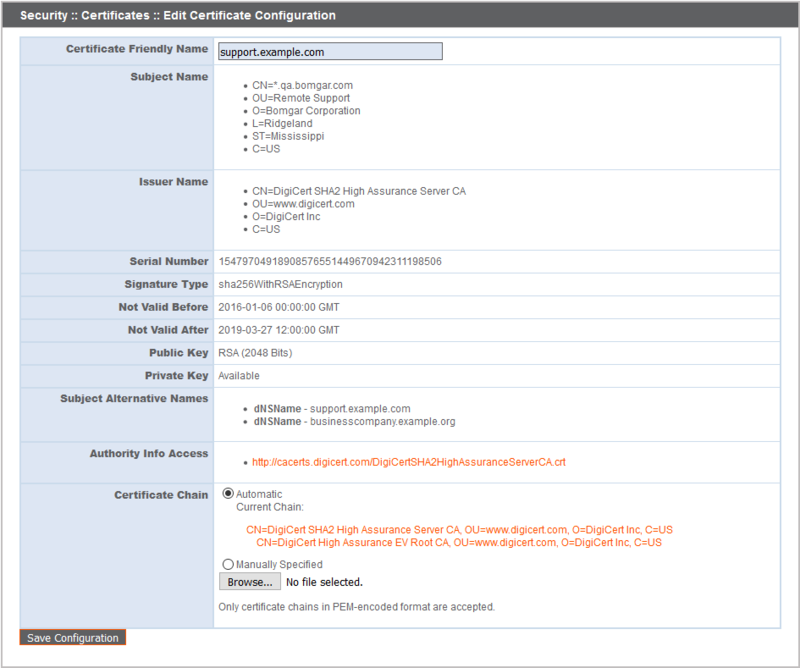 Locate this root certificate on the root store of your CA's online root store. Once done, download it from the CA's root store and import it to your Secure Remote Access Appliance as described above. View a table of SSL certificates available on your appliance. To learn more about SNI, please see Server Name Indication. Click a certificate name to view details and manage its certificate chain. To export one or more certificates, check the box for each desired certificate, select Export from the dropdown at the top of the table, and then click Apply. If you are exporting only one certificate, you immediately can choose to include the certificate and/or the certificate chain if available. Click Export to start the download. If you are exporting multiple certificates, you will have the option to export each certificate individually or in a single PKCS#7 file. When selecting to export multiple certificates as one file, click Continue to start the download. With this option, only the actual certificate files will be exported, without any certificate chains. To include certificate chains in the export, select individual export and click Continue to view all selected certificates. For each listing, choose to include the certificate and/or the certificate chain if available. Click Export to start the download. To delete one or more certificates, check the box for each desired certificate, select Delete from the dropdown at the top of the table, and then click Apply. Under normal circumstances, a certificate should never be deleted unless it has already been successfully replaced by a working substitute. To confirm accuracy, review the certificates you wish to delete, and then click Delete. View a table of pending requests for third-party-signed certificates. Click a certificate request name to view details. The detail view also provides the request data you will give your preferred certificate authority when requesting a signed certificate. If you are renewing a certificate, use the same certificate Request Data that was used for the original certificate. To delete one or more certificate requests, check the box for each desired request, select Delete from the dropdown at the top of the table, and then click Apply. To confirm accuracy, review the certificate requests you wish to delete, and then click Delete. View a table of private keys associated with certificates and certificate requests on your appliance. 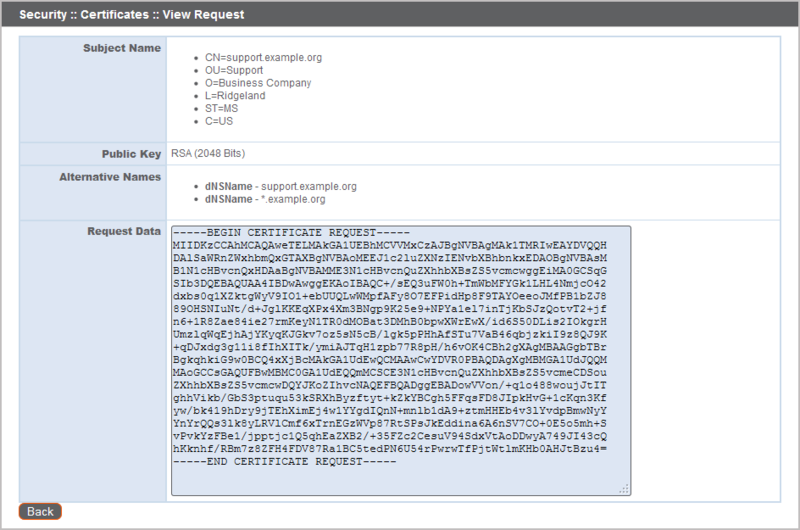 Click a linked certificate name or request name to view details about that associated item. To export one or more private keys, check the box for each desired key, select Export from the dropdown at the top of the table, and then click Apply. For each private key you are exporting, choose if you want to include an associated certificate. If the key applies to more than one certificate, select which certificate to include. Certificate requests cannot be included in the export. Optionally, secure the private key with a passphrase. Click Export to start the download. To delete one or more private keys, check the box for each desired key, select Delete from the dropdown at the top of the table, and then click Apply. To confirm accuracy, review the private keys you wish to delete, and then click Delete.